Choosing the best toys for babies when you’re shopping for a special occasion can be lots of fun, but sometimes it can also be tough to know just what toys best suit infants in their first year of life. To help make things easier for you, we’ve spent countless hours researching hundreds of baby toys so that we could present you with only the best of the best. The most important thing to us is that all the toys on our list are of the highest design and safety standards so that you can be sure these toys are completely safe and very well made. It was also a top priority for us to be sure the toys we’ve selected are all age-appropriate, based on how babies develop in the first 12 months. And of course consumer feedback from parents, grandparents, aunts, uncles and other caregivers who have already bought these toys played a big role in what toys did and didn’t make the cut. We’re confident that we’ve hand-picked some of the best baby toys that will help your little one discover, learn and grow during that all important first year of their life. And we hope our top toy picks will help you choose the right toy for all the little ones on your shopping list, no matter what the occasion! 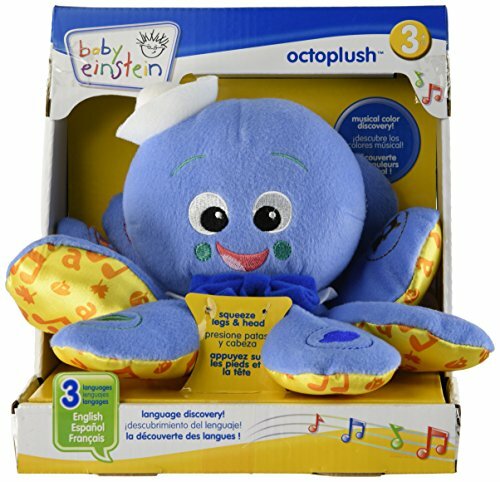 If you have a nautical themed nursery for the newest member of your family, then the Baby Einstein Octoplush toy will make the perfect addition to your nursery and may well become your baby boy or girl’s best buddy. The Octoplush is a soft and lovable and will become a great educational toy for your baby once they get to the stage where they are sitting up and able to fully appreciate this wonderful toy. This octopus plays music when hugged around the head and it is designed to teach your child colors in English, Spanish, or French; a simple flip of a switch allows you to choose the language you prefer. When your infant squeezes different legs, they will hear the color names which will be followed by a short tune. Octoplush takes 2AA batteries (included) and is recommended for children age 6 months and up but can also be used by younger infants under strict supervision. Both parents and babies love this cute little octopus adorned with a bow tie and sailor hat. What’s not to love about the gorgeous Humphrey The Elephant from Bedtime Originals! Measuring about 9″ long by 8.5″ wide and made from 100% polyester, Humphrey is a lovable elephant that babies just adore cuddling. Humphrey Elephant comes in a seated position, which is great as he can sit in beside baby in their crib and there are lots of appendages for baby to grab. Parents love the super softness and high quality of this plush stuffed animal and that fact that the coat is non shedding. Some parents even knitted a little scarf for Humphrey in the colors of their baby’s room, to make him extra special. 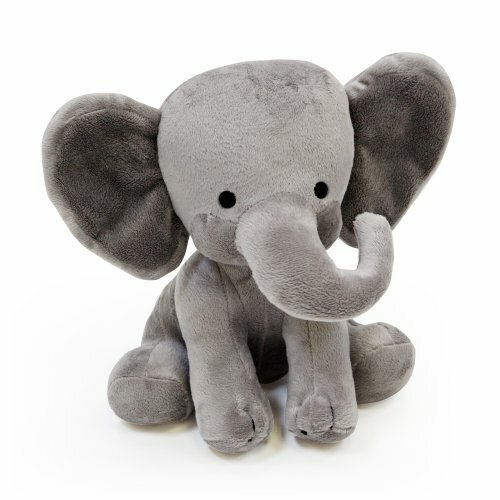 Recommended for newborns and up, with even adults getting a Humphrey of their own, this cute little elephant is more than suitable for both baby boys and baby girls. 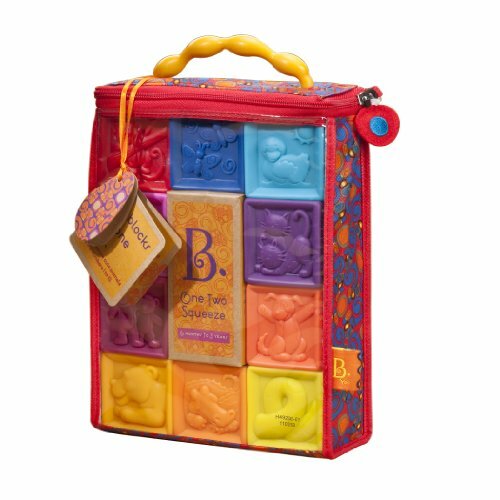 The B Toys B One Two Squeeze Blocks is a set of 10 numbered blocks that comes in a handy storage bag. In addition to being easy to squeeze and BPA Free, these blocks also have cute animal pictures displayed on them. One of the great things about these blocks is that they are multi-purpose; your baby can squeeze them, stack them, and even chew them! They also float, so a wonderful pool or bath toy for your little one to enjoy. These gorgeous blocks have been sculpted by hand and designed to hold your baby’s interest and encourage them to engage, explore and create. And of course they squeak! What child doesn’t love a squeaky toy they can build with! Suitable for children 6 months to 3 years, these squeeze blocks are loved by both babies and their parents and make a fantastic gift for any boy or girl. The Fisher Price Kick And Play Piano is a fabric piano that takes 3 X AA batteries (not included) and can be attached to the foot of the crib. When your infant kicks this piano, they are treated to colorful flashing lights and fun music. You can also set the piano to play a short tune to help lull your infant to sleep. 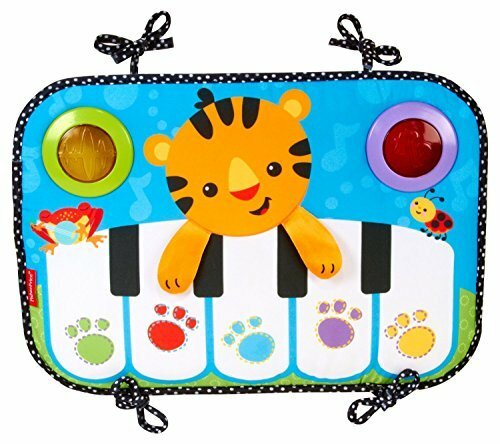 Made from soft material, brightly colored with ‘little friends’ for your baby to engage with, this wonderful musical kick and play piano with stimulate and engage your baby’s senses. Designed for babies from newborn to 2 years old, both adults and infants find this piano to be the ideal crib toy, which can be moved to the floor as your baby grows. This piano can play individual notes or a short tune and is not overbearing for parents! 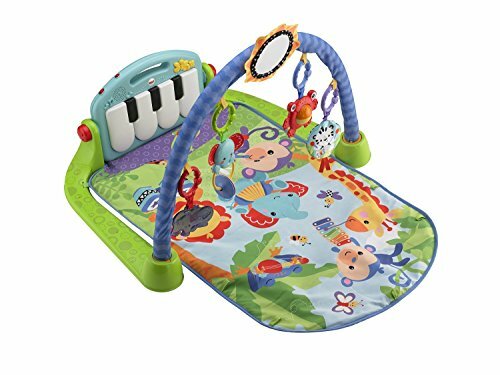 This wonderful Fisher Price Kick And Play Piano Gym If you are looking for a baby gym offers your infant lots of entertaining and educational activities. It’s made of polyester and has an arch with multiple toys including a teether, a clacker, a mirror and a piano that plays music when kicked. The arch can be removed so that your baby can have some quality tummy time or to allow them to sit up and have fun playing the piano. You’ll love hearing your baby squeal with delight when they make the piano play! Not to mention the excitement they’ll have playing with all the hanging toys. This piano gym is Phthalate Free, Latex Free, Lead Free and BPA Free and it will keep your infant happily entertained for long periods of time. The Kick n Play Piano Gym is compact so it won’t take up a lot of space and it’s designed for children 2 months to 1 year old. This adorable 13″ GUND My First Dolly is a wonderful first doll for your baby! The soft and cuddly doll comes dressed in a pink embroidered jumper with a cute polka dotted shirt underneath. Both the jumper and the blouse are accented by lovely white lace trim. Some bangs of her beautiful brunette hair are visible and she’s wearing a delightful little floppy pink hat that has two pretty embroidered flowers. She is also available with blonde hair. All the features of this charming baby doll are embroidered so she poses no choking hazard for your baby. Plus she’s completely machine washable which makes her the ideal doll for your little one because she’s so easy to keep clean. Speaking of washing, more than a few parents said they opted to buy 2 of these dolls at once so their little girl wouldn’t be left without their favorite doll while it’s in the wash. Recommended for newborns and up, this lovable plush GUND doll makes an excellent first pretend friend for your little girl! The Baby Einstein Take Along Tunes gives your infant their own little radio to explore different musical melodies. This easy to grasp toy has a handy volume switch and large buttons for baby to push. The ideal musical toy for children age 6 months to 3 years, Take Along Tunes is loved by both parents and children alike. A lot of babies find the music soothing and relaxing, and some even nod off to sleep while listening to it. And when they get to the walking stage, your toddler will love carrying their own radio around with them wherever they go! The good news for parents is that the Baby Einstein tunes are not too loud or too annoying! 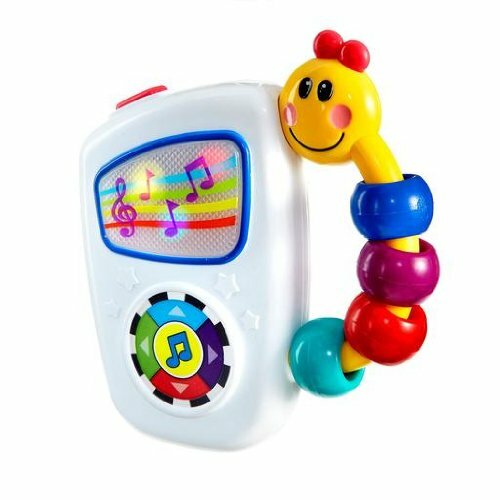 When your infant starts walking, they will enjoy carrying this music toy with them, playing the tunes themselves and dancing to the beat! 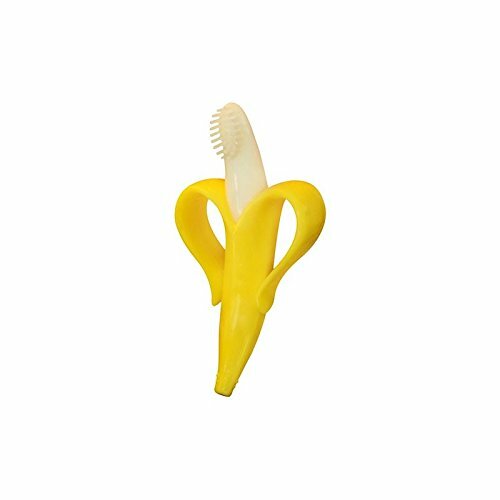 While not really designed as a regular teether, this Baby Banana Toothbrush And Teether not only introduces your infant to having their teeth brushed, but has also proven to be comforting to children who are teething. Designed for infants age 3 to 12 months old, this toothbrush is both dishwasher and freezer friendly, making it easy to keep clean and perfect for gently cooling your baby’s gums. Parents think this award winning baby banana toothbrush is very cute and love the fact that it is safer than a regular plastic toothbrush. This cleverly designed infant toothbrush was designed by a registered Dental Hygienist and her mother-in-law who wanted to create a safer training toothbrush for babies. It is made from 100% Food Grade bendable soft silicone and easy for your baby to hold. Completely BPA, Latex, Phthalate, toxin free giving parents peace of mind. And the bonus is that it doubles up as a teether! And what baby wouldn’t love to have a baby banana teether? 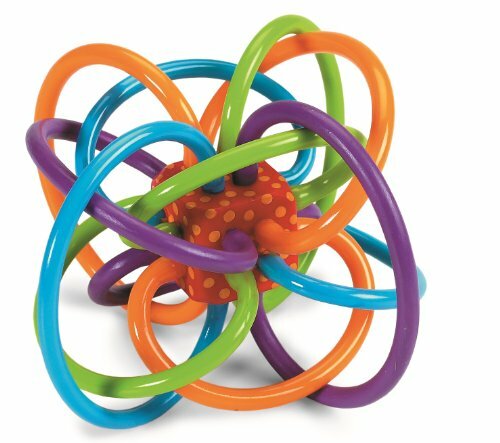 The Manhattan Toy Winkel Rattle Teether Activity Toy may look like one big colorful plastic knot, but it’s actually a teether and a rattle all rolled into one. Made of BPA Free plastic, this Winkel Teether Toy is designed for children who range in age from newborn to 2 years old. The Manhattan Toy Company has been making toys for almost 40 years and this baby Winkel Activity Toy is not only one of their go-to classics, but also a ‘must have’ for all parents with teething babies. What’s alluring about this Winkel Manhattan Toy is that it is a maze of soft tubes with beautiful bright and bold colors, all intended to capture your little one’s attention. Super easy for your baby to hold, they will become fascinated by the rattle while chewing on the toy to help soothe their gums during teething. 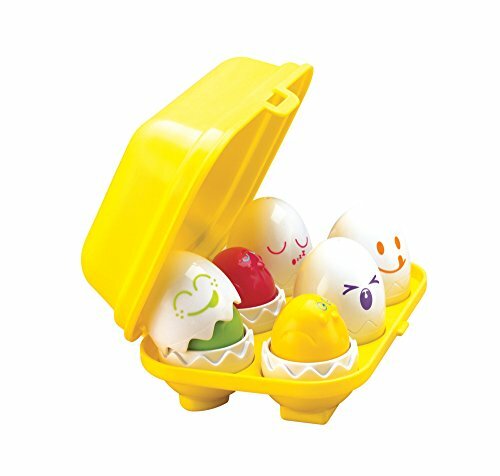 These TOMY Hide And Squeak Eggs are not only tons of fun but they’re also a great learning toy that will grow with your child! This toy consists of an egg carton that holds six eggs that when cracked open reveal 6 egg shaped chicks inside. Suitable for ages from 6 months to about 3 years, this is great engaging and interactive toy, as kids absolutely love the chicks and making them squeak. Both parents and babies love these TOMY Hide N Squeak Eggs because they are quite unique and different from other types of interactive toys. 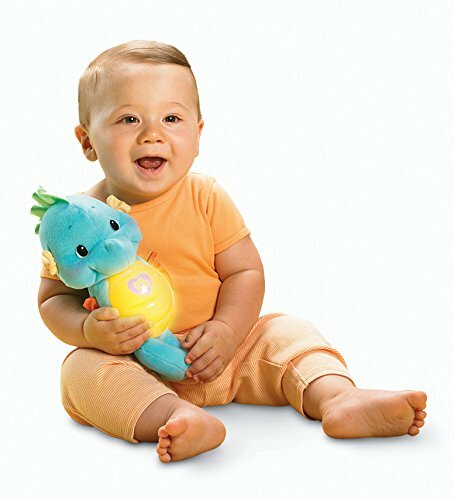 The Fisher Price Soothe And Glow Seahorse is a cute little stuffed animal seahorse that’s perfect for infants. In addition to a soft glowing light in its stomach that comforts your baby, when this delightful seahorse is squeezed, 5 minutes of continuous music and sounds will start which are perfect to help lull your child to sleep. As the 5 minutes ends, the music and sounds will gently fade away and the light will stop glowing. This gorgeous seahorse has a volume control and uses 3 X AA batteries which are included. It is surface washable and comes in both pink and blue, making it suitable for both boys and girls. Perfect for children age 6 months to 4 years old, the Fisher Price Ocean Wonders Soothe And Glow Seahorse is the perfect night-time friend for your baby. This adorable soothe and glow seahorse is soft and extremely huggable – just perfect for your little one! These IQ Baby Knock-Knock Blocks from Small World Toys are a group of 16 blocks – 8 square blocks and 8 triangular blocks. The blocks are recommended for newborns and kids up to 3 years old and they are a wonderful starter set for any baby boy or girl. Made of soft material with peek-a-boo windows and doors, some of the blocks even have beads that rattle. All the blocks have different sensory features; bells, rattles, crinkly sounds and they have textures such as velour, satin, and corduroy. There are different characters behind each door on the blocks, and a scene on the back of each door to keep your baby engaged and entertained. And the doors are different styles to make it even more interesting for your child. Small World Toys have been making toys for kids for over 50 years now, so they are very experienced in creating toys suitable for babies. The IQ blocks are super light and easy for your child to handle and manipulate. One of the most notable features is the black and white graphics on the triangular blocks and the colorful graphics on the square blocks. These blocks are a hit with both parents and children as they captivate and hold a baby’s interest while encouraging them to explore the little builder inside them! Watch with pride as your baby stacks their first blocks, knocks them down again, laughs gleefully and starts over again! Every baby loves music and finds it soothing and this cute Tiny Love Soothe N Groove Mobile delivers both those things. To keep your baby amused, this charming crib toy will play up to 40 minutes of non repetitive music at a time, comprised of 18 different tunes spanning 6 categories of music. It is made up of plastic and polyester, and in addition to the built in night light, it also features 3 adorable animals – a giraffe, a monkey and an elephant. Any one of those delightful little animals will help amuse and soothe your baby. Perfect for newborns through 2 years old, both parents and babies love this crib mobile and it is available in two gorgeous colors – Blue (featured) and Tiny Princess Pink. This groove mobile can be placed on any style of crib and the volume can be adjusted – a feature that’s always loved by parents! Lions and monkeys and butterflies – Oh My! 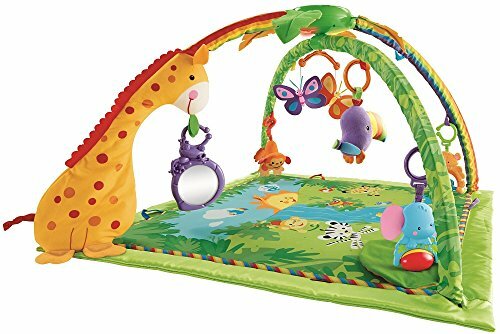 The Fisher-Price Rainforest Melodies And Lights Deluxe Gym is perfect for babies, offering them a wide variety of activities to fire up their imagination and allow them to explore and learn. This wonderful baby gym responds to your infants movements with music sounds and lights when in baby mode, though it does need 3AA batteries for the lights and music to work. 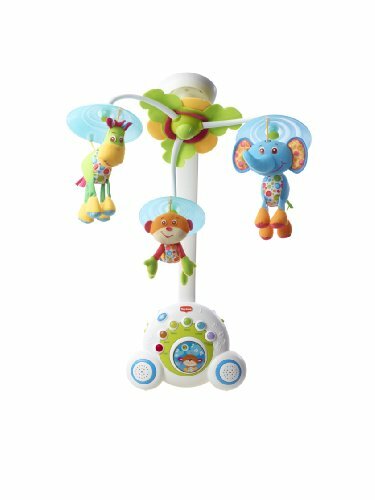 There are 3 modes of play for baby available with the Fisher Price Melodies & Lights Deluxe Gym – Baby mode, Music mode and Rainforest mode. Baby mode is where your baby’s movements will trigger a response, such as 8 to 12 seconds of lights and music. Music mode is where your baby gets 20 minutes of continuous music to stimulate their auditory senses. And Rainforest mode is where you baby gets to relax to the soothing sounds of the rainforest for about 20 minutes. In addition, it includes a number of hanging toys for your baby to interact with and play with; monkey, toucan, butterflies, elephant and so much more! Designed for children age 2 to 12 months, this gym is sure to be a favorite playtime place for your infant and is a hit with both parents and babies. There’s so much going on with the Sassy Rattlin Rings that your baby is sure to be captivated! The bold black and white section will appeal to younger babies and the brighter colors will be more attractive as your baby’s sense of color and vision grows. This ring features 4 different textures, three small rings your child can manipulate, and is BPA and Paint Free. Your baby will enjoy exploring each texture and finding the one that gives them the most comfort. 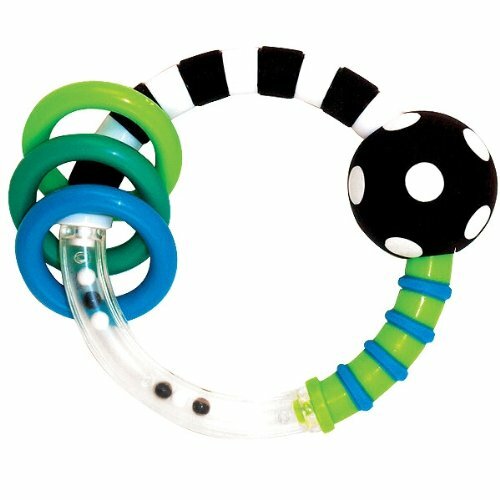 The clacker rings on this Sassy Ring Rattle with provide engagement for your baby and hold their attention as they work out how to manipulate them along the rattle and against each other to make noise. Watch you infant’s face light up when they realize that the beads inside the clear plastic section move! This is something they will become fascinated with as it will capture their focus and interest. Best suited for children age 3 months to 1 year, this rattle would make a great baby shower gift for any baby. 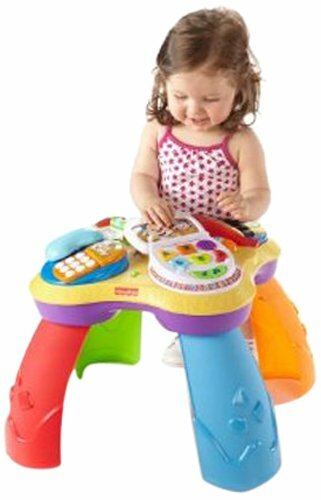 The Fisher Price Laugh And Learn Table offers your infant a variety of activities as well as over 60 songs, tunes and phrases. Loaded with interactive content to keep your baby girl or boy engaged and moving around the table, there are 4 activity corners that light up. There is a laptop section that opens up and closes down like a real laptop and it encourages your child to partake in active role playing with the main characters – Puppy and Monkey. Your little boy or girl will love listening to Puppy read aloud from the interactive reading book. Oh and what little infant doesn’t love mimicking Mom or Dad on the phone, which is exactly what your little one can do with the phone activity corner, featuring Puppy and Sis! And they will be bowled over with excitement with joining Monkey playing around at the piano keys! This Fisher Price Laugh And Learn Puppy Table grows with your child as it can be used with or without legs. It is suitable for kids age 6 months to 3 years and for both boys and girls. Parents really love this Fisher Price Laugh And Learn Activity Table for their children because it target 4 key developmental areas – Imagination, Music, Learning and Bi-lingual learning (English and Spanish). But more important than all of that is that it is a whole lot of fun! This Fisher Price Laugh And Learn Musical Table is also bi-lingual, providing learning in both English and Spanish. What makes the Bright Starts Clack And Slide Activity Ball such a wonderful toy is that it has a number of activities all rolled into one ball! This ball measures 6″ X 6″ X 6″ and features a springing frog, a caterpillar that slides, a mirror, moveable rings, squeaker and rattle beads. Parent really like this activity ball because there are lots of things for their infant to play with. 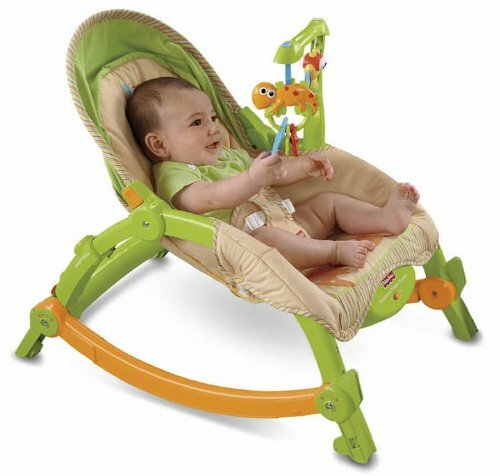 It has great bright colors and makes fun noises to keep your little one entertained. This is a very tactile toy with different textures for your baby to explore and interact with. Suitable for both boys and girls between the age of 3 to 12 months, there’s so much for your child to look at and touch, that it’s sure to hold their interest for long periods of time. 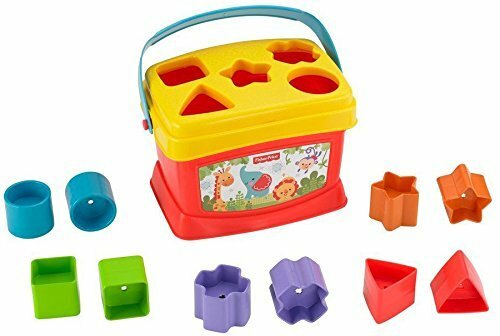 The Fisher Price Baby’s First Blocks are more of a shape sorter toy than a set of stacking blocks but they can be stacked as well as sorted into shapes. 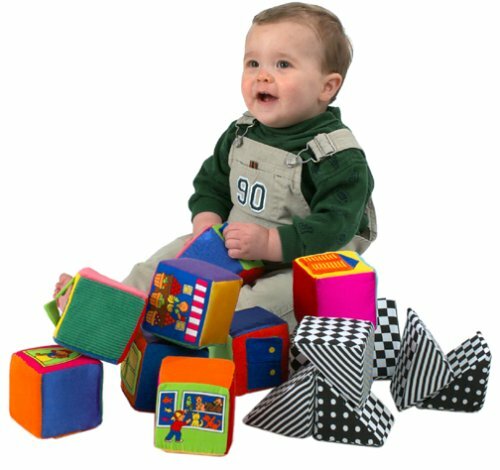 This set of 10 brightly colored blocks comes in 5 different shapes and it is recommended for children from 6 months to 3 years. Your baby is going to have a blast dropping these blocks into the open bucket! And for an added challenge, your little one will baby will be delighted the first time they figure out how to put one of the shapes through the shape-sorting lid! Can’t you just see the joy on their face! This is definitely a super engaging stacking and sorting toy that’s sure to keep your baby amused and entertained. This Baby Einstein Bendy Ball is a soft flexible plastic ball with a rattle on the inside and the infamous Baby Einstein cute caterpillar on the outside. The ball measures 4″ X 4″ X 4″ and is very easy for your infant to grab. And once they’ve got a hold of it, they’re sure to enjoy the rattle sound it makes when it’s shaken. For some babies, it becomes a good soothing toy, calming them down when they get upset. It’s the perfect interactive infant toy for baby girls and boys and they’ll enjoy manipulating it every which way they can for amusement and fun. 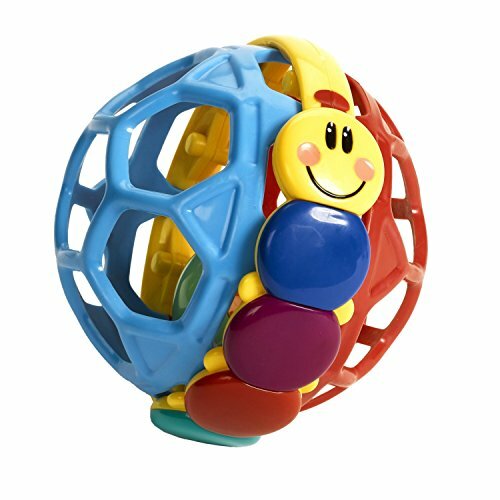 Baby Einstein toys are very popular with little ones and their parents alike and this fun little bendy ball is no exception. Although it’s recommended for infants between the ages of 3 months and 1 year, many parents and grandparents have purchased this toy for kids as old as 3 years. Designed to grow with your baby, the Fisher-Price Newborn-To-Toddler Portable Rocker is very popular and for good reason. This rocker can vibrate or be rocked manually, soothing and comforting your baby and lulling them off to sleep. 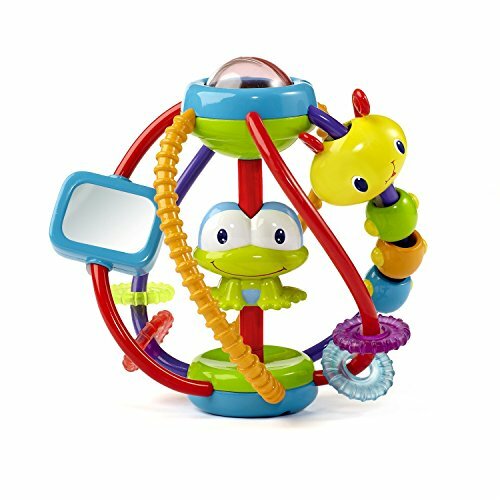 It also has two fun and colorful hanging toys that will attract your baby’s attention and give them something to play with. Parents love this Fisher Price Portable Rocker because it’s soft, comfortable, very versatile, easily moved throughout the house and easy to wipe down and keep clean. Recommended for newborns to 3 year old toddlers, some parents found that when their baby was out of sort and wouldn’t sleep in their crib, they’d fall fast asleep in this rocker. The cover of the chair is washable – always an important feature for parents! 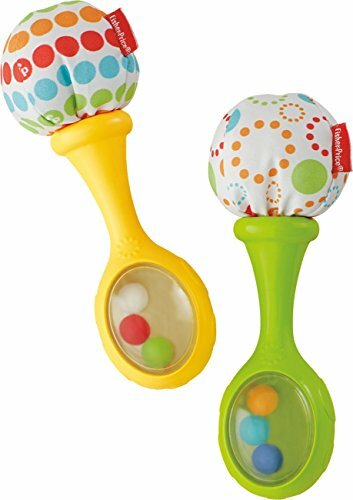 The Fisher Price Rattle And Maracas are the perfect play maracas for any baby on your shopping list. They feature a soft pom pom bottom and colorful beads inside the maraca heads. These little rattles are fun for baby and a godsend to parents, because they keep your little one entertained and amused, while helping improve their motor skills and sensory development. Suitable for infants ranging in age from 3 months to 1 year, these maracas are the ideal size for tiny hands to hold. Your baby boy or girl will smile with delight the first time they shake these maracas and hear the rattle sound!